Cliff Cottage, built in the 1880s and now lovingly restored and refurbished, is one of the Inn's five elegant homes. 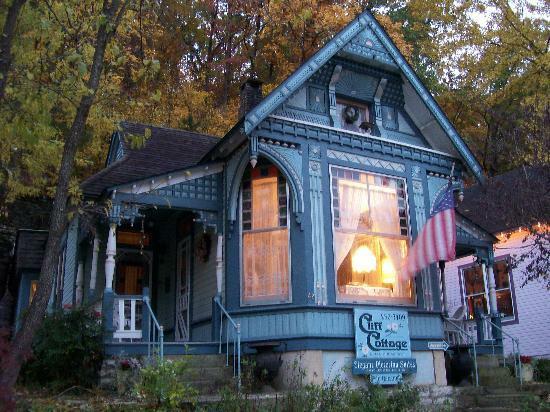 The jewel of Cliff Cottage Inn in this Victorian artist colony, Eureka Springs, Arkansas. The Inn comprises three homes featuring luxury suites and two individual historic cottages. Cliff Cottage Inn is a Bed and Breakfast that specializes in romantic and vacation getaways, honeymoons and elopement weddings, anniversary celebrations and ladies' shopping sprees and is the only B&B right in the very heart of the Historic Downtown of Eureka Springs, Arkansas. Choose from six luxury Bed and Breakfast suites or an individual cottage or a studio, both all by themselves, just a few paces from the main Inn, all offering privacy and solitude with fabulous views of the historic village. Cliff Cottage Inn, a Bed and Breakfast celebrating more than a decade of continuous operation under the same innkeeper, is the only inn with an elf who delivers a gourmet hot breakfast right to your door! Southern Living Magazine said, "Cliff Cottage Inn's breakfasts are definitely not to be missed!" and you can enjoy them on your private balcony or deck, or even decadently in your jammies.